It’s almost San Diego Comic-Con time, which means here comes the SDCC exclusive toys that will pay the rent of eBay scalpers for months to come. NECA just announced their big exclusive set and good lord. It’s beautiful. Two Teenage Mutant Ninja Turtle box sets, based off of the colors of their appearance in the Teenage Mutant Ninja Turtles arcade game. 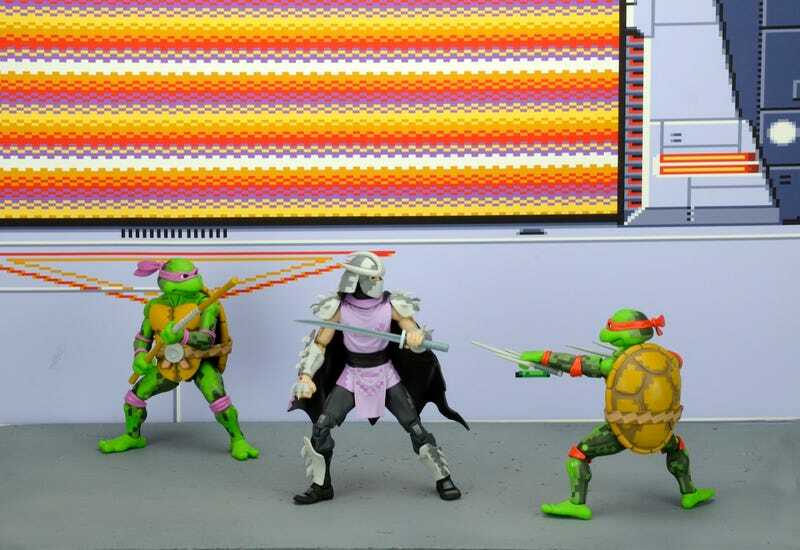 The first box set will feature all four turtles, done in “video game-style” colors, (similar to NECA’s line of video game style painted figures), and will come with interchangeable hands, their signature weapons, and PIZZA POWER UPS. The second set will feature The Shredder and three Foot Soldiers, with game specific weapons(!) painted in a similar style. Here’s the text from NECA’s official announcment. NECA has really done a lot over the years to SHUT UP & TAKE MY MONEY, as their toys often have high quality sculpts that don’t skimp on the articulation, with super fun and creative paint jobs, but this? This is me sending them a blank check. You can view more pictures and a video over at NECA’s website, but I’m just going to sit here and drool for the next hour. Pricing hasn’t been announced, but NECA says pre-order information for non attendees will be up soon. It’s also worth noting that NECA doesn’t like to “Use and Lose” molds, so it’s entirely possible that we might be getting single retail releases of these figures at some point in the future. I hope. Please?